I initially installed Ubuntu Linux 5.10 on my new Dell Inspiron 6000 in November, 2005. I fully expect it to begin having assorted hardware problems this year with the amount of use I give it, though hopefully using an external keyboard (excellent, and only $4.99) and mouse at work will extend its life. Resume from suspend-to-memory was broken. A fix in the form of an upgraded acpi-support package was available in the next couple days. I didn’t upgrade to 6.10 upon release, mostly because I just didn’t get around to it. I saw a couple days ago that 7.04beta is out, so I finally upgraded to 6.10. The upgrade process went without a hitch, but resume from suspend-to-memory was broken again. I’m sure there’s an easy fix, but I decided to take the plunge and upgrade to 7.04beta. Everything now works, though as Brad Templeton notes the upgrade process stopped several times, waiting on my answers to unnecessary questions. Apart from this annoyance, which hopefully will be fixed before 7.04 gets out of beta, I remain impressed with Ubuntu and how it is progressing. I’m also reminded of how rapidly free software projects are doing new feature releases. I don’t think there are any visible applications I use on this laptop that haven’t been significantly improved in the last 17 months. I’m not going to link to any offenders, but my consistent observation is that nearly all “citizen journalism” sites fall somewhere between spam blog and crappy community of suckers. If you feel the urge to provide people with a platform to “do” community journalism, don’t. You’re not needed (see below). If you really, really must go ahead, read Evan Prodromou’s seven rules for commercial wikis (which apply to any community site) seven hundred times, then think about it for a long time. Write on your own blog. Write on a site of, by, and for some community (check if they are following the seven rules linked above; it should be obvious). If you want a generic platform, write on Wikinews. Some reader blogs hosted by established media aren’t that bad, but be careful. If working for a new project of a startup-like nonprofit in San Francisco involving [open] education, [copyright] law, and [semantic web] technology, perhaps you should look into applying for Executive Director of CC Learn. I could imagine an education, legal, or technology person with some expertise and much passion for the other two working out. Student programmers, Creative Commons is participating in Google Summer of Code as a mentoring organization. It is too late to apply for a summer technology or “free culture” internship, but keep CC in mind for next summer and (possibly) this fall. Do you like the concept of free speech on the web? 76% say “No. 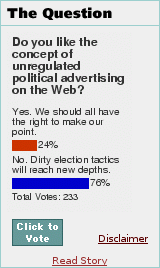 Dirty election tactics will reach new depths.” in a San Francisco Chronicle online poll (no permalink, see image at right). The article linked from the poll concerns a video mashup of Apple’s 1984 advertisement with Hillary Clinton as Big Brother and Barack Obama as Apple. Fortunately the article does not mention calls to suppress speech, but they will doubtless come as this form becomes more important and opportunists see polls such as the above. It may have been possible to suppress speech in the broadcast media without tremendous collateral damage. On the net, I doubt it. Hillary 1984 works about as well as the original and captures Clinton saying nothing. But neither ad works for me — both scream “same as the old boss.” The woman with the sledgehammer needed inside help to get so close and is either part of an elite faction or the dupe of one. Apple is just another proprietary vendor and I’m sure Obama can say nothing as well as any politician. For the record I prefer Obama over Clinton though Bill Richardson is my preferred Democrat candidate for temporary dictator of the U.S. I hate John Edwards (the whine plus the drawl really gets at me), but in truth it’s a narrow field.